Ambassador Peter Flanigan Sets The Record Straight on ReGripped! Ambassador Spotlight: Meet Ryan Marshall! Jim Jamieson on “Can You Really Play in Those?”: With a Record Setting 8-under 64, We Rest Our Case. Canoos is a brand based out of Massachusetts that tries to bring back some classiness to golf shoes by modeling them after docksiders. I really dug the concept and recently tried out their special Walker Cup version with canvas tops. The shoes work just like normal golf shoes even if they don’t look like golf shoes and that is fantastic. The styling is subtle but classy with some great scripting details from Canoos. The rawhide laces do take a little getting used to and definitely are not your traditional shoe laces. Also, I have not tried these out in adverse conditions so I can’t tell you how the canvas holds up on rainy mornings but I look forward to trying them out! Posted on November 29, 2017 Leave a comment on Ambassador Peter Flanigan Sets The Record Straight on ReGripped! How many candles were on your last birthday cake? What brings home the bacon? How did you become an ambassador for Canoos? 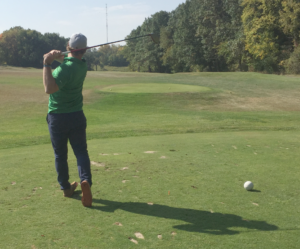 What are your favorite sports (other than golf)? What do you do to help spread the word? What about Canoos makes them your footwear of choice? If you could play a round with any golfer, past or present, who would it be? What is your favorite style of Canoos? If you could design the next Canoos style, what would it look like? I reached out for a job cause I loved the product concept. Eventually became a ambassador. Still would love a job there (haha)! Wear my Canoos on the course and hand out my cards. People love the kicks. I post a few pics on Twitter and Instagram too. I like how they don’t look like golf shoes; they are comfortable. Normal golf shoes feel bulky to me and look terrible with a pair of shorts. They fit my style and work great, too. Arnie Palmer, Rory Mac and Bill Murray would be the ultimate foursome. Men’s Tour 3.0. 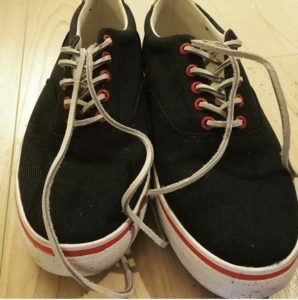 I am thinking about the canvas shoes, but I haven’t purchased yet. Posted on October 10, 2017 October 10, 2017 Leave a comment on Ambassador Spotlight: Meet Ryan Marshall! BOSTON, MA, September 8, 2017 — Canoos, the golf footwear innovator, announced this week that it has designed and provided custom golf shoes for Team USA in its upcoming matches for the 2017 Walker Cup. Similar to the Ryder Cup, the Walker Cup dates back to 1922 and is a biennial competition between the 10 best amateur golfers in the U.S. versus the 10 best from Great Britain and Ireland. This year’s event is being held September 9-10 at the Los Angeles Country Club. 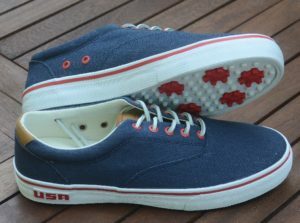 The Team USA shoes will feature the same design and patented golf spike outsole that Canoos uses for all of its canvas golf shoes. 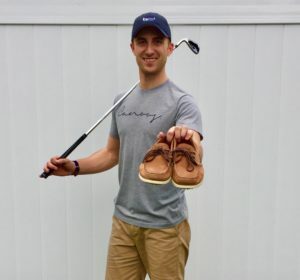 “Just like our original boat golf shoes, the canvas shoes are all about providing a functional and fun alternative for golfers to wear from the course to the 19th hole and beyond.” Bacas said. The competition began in the wake of World War I, and came together following a series of meetings between the United States Golf Association and The Royal and Ancient Golf Club. As part of the meetings an international team competition was discussed, with the aim of strengthening of understanding and friendship between The R&A and the USGA. Among those attending the meetings at The R&A was George Herbert Walker, USGA president in 1920. The idea of an amateur team competition appealed to Walker and he soon presented a plan and offered to donate a trophy. When the press dubbed the trophy the Walker Cup, the name stuck. The first Walker Cup Match was held in 1922 at the National Golf Links of America in Southampton, N.Y. Led by playing captain William C. Fownes Jr., the USA won the inaugural Match, 8-4. The USA leads the series 35-9-1. Thanks to our friends at The Redding Pilot for their great article on our new Walker Cup Canvas Golf Shoes! Try and come up with a better trifecta. We’ll wait. While you’re thinking about it, we’d like to present some of our favorite hot dogs (and not quite hot dogs) found on golf courses across the U.S.A. The most infamous hot dog in golf may not be a hot dog at all. The Olympic’s Burger Dog is really a beef patty formed to fit a toasted hot dog bun and slathered with cheese, onions, pickles and relish. Today, three stands dispense burger dogs across the Olympic Club’s course. It’s not hard to find hot dogs at golf course snack shacks. But the 11th tee at Florida’s Mountain Lake course serves theirs with a generous helping of chili. It may not improve your subsequent tee off, but it’s good for the soul. The Badger State is known for its hearty cuisine, so it’s understandable if a hot dog comes across as a touch too light for local tastes. Remedying that is the Spring Valley Country Club, which provides a meatier upgrade in the form of a Polish sausage between a split bun. You’re not supposed to call it a hot dog. But the famous “white hots” native to Central and Western New York state are pretty close—they’re basically unsmoked hot dogs, which allows them to retain their white color. And there’s arguably no better place to have one than at the snack shop between the 9th and 10th holes of the Rochester Country Club. OK, so we might be cheating on this one. Walter’s isn’t situated on golf course property, but it is a five-minute drive from the Winged Foot Golf Club and well worth the stop. The shack, which has been operating for 98 years, serves a custom-blend hot dog that’s cooked with a secret sauce, split down the middle and covered in a house-made mustard. We’re incredibly excited to now count a Canvas Golf Shoe among our range of Canoos® products. We know that you’re just as excited to spread the good word about them, so we thought we’d shared some quick, super-digestible lines about the shoe that you can share with friends, colleagues and maybe the mirror. – The Canvas Golf Shoe is the most casual style we’ve ever made, but it has exactly the same level of performance power as our other models. – Its 10-eyelet profile allows for an easy, adjustable fit. – Its rawhide laces make everything a touch more rugged. – It’s double-stitched to be extra durable. – Just like our other shoes, it has an Ortholite® insole that gives feet maximum comfort and support. – It’s water-resistant and ready to play in all conditions. – It comes in three distinct colors: sand, storm and tide. – They’re just as comfortable as your favorite pair of sneakers. WILMINGTON, Mass., July 11, 2017 /PRNewswire/ — Canoos, the golf footwear innovator, kicked-off its regional truck tour that brings their acclaimed, patented golf shoe styles to public courses, private clubs, and golf ranges across New England. “From Connecticut to Maine to everywhere in-between, we’re coming to a clubhouse near you,” says Canoos Brand Manager, Will Bacas. The Canoos Truck Tour hits the road! Participants can try on different styles, test them out on the range and see how the most comfortable shoes in golf really feel on and off the course. Included on the truck tour are Canoos® latest two releases—the Tour 3.0 and the Canvas Golf Shoe. Each will be available in a full range of sizes to suit every golfer’s sizing needs—including up to size 14. The Tour 3.0 is a refresh of the original Boat Golf Shoe™ that started it all, and features a water-resistant, premium leather upper. The Canvas Golf Shoe is the most laid-back Canoos style yet, matching the looks of your favorite, go-to sneaker. Both the Tour 3.0 and Canvas Shoe styles benefit from Canoos’ patented soft spike outsole and breathable OrthoLite® insole providing unparalleled comfort and swing stability. The Canoos Truck Tour got rolling on July 8th and continues through Labor Day. If you are the proprietor of a course, club, or range and are interested in having the Canoos truck tour stop at your location, please contact Grace Pallazola for more information. You can find the Tour 3.0 and the Canvas Golf Shoe on Canoos.com. Canoos is the maker of the original Boat Golf Shoe™. Their patented design provides the comfort, stability and look that golfers of all abilities can enjoy on and off the course. From the most discerning golfers to those who just enjoy an occasional round, they all enjoy the ability to “golf in the shoes that got you there.” For more information about Canoos, please visit canoos.com and follow Canoos on Instagram and Twitter @teamcanoos. We’re incredibly excited to now count a Canvas Golf Shoe among our range of Canoos products. We know that you’re just as excited to spread the good word about them, so we thought we’d share some quick, super-digestible lines about the shoe that you can share with friends, colleagues, and maybe the mirror. – Just like our other shoes, it has an Ortholite insole that gives feet maximum comfort and support. – It comes in three distinct colors: sand, storm, and tide. If our Patriot Shoe celebrated a birthday, it would be the Fourth of July. If our Patriot Shoe had a favorite book, it would be the U.S. Constitution. If our Patriot Shoe sang, it would belt out “The Star Spangled Banner” so beautifully it would bring a tear to your eye. 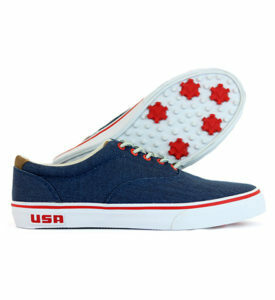 Like America, the latest colorway of our Tours 3.0 Boat Golf Shoe™ is exceptional. We originally designed these special edition shoes exclusively for this week’s U.S. Senior Open, and all volunteers at the event will be wearing them. But once we saw the finished product, we knew they were just too cool not to share with all our customers. So, we’re selling them in limited quantities online now up to size 14. Anything less would be un-American.